After Hurricane Matthew, Floodwaters Rise To Record Levels In North Carolina : The Two-Way As the rainwater dumped by Matthew flows downriver, towns are being overwhelmed by devastating floods. "You're dealing with just massive amounts of water," one reporter says. A street in Lumberton, N.C., was flooded on Monday. Torrential rains are continuing to fuel floods, days after Hurricane Matthew barreled up the U.S. coast and then headed out to sea. When Hurricane Matthew lost strength and headed out to sea over the weekend, the storm took its high winds and driving rains with it. But it left behind water — from the record rains that fell during its trip up the southeastern U.S. coast. 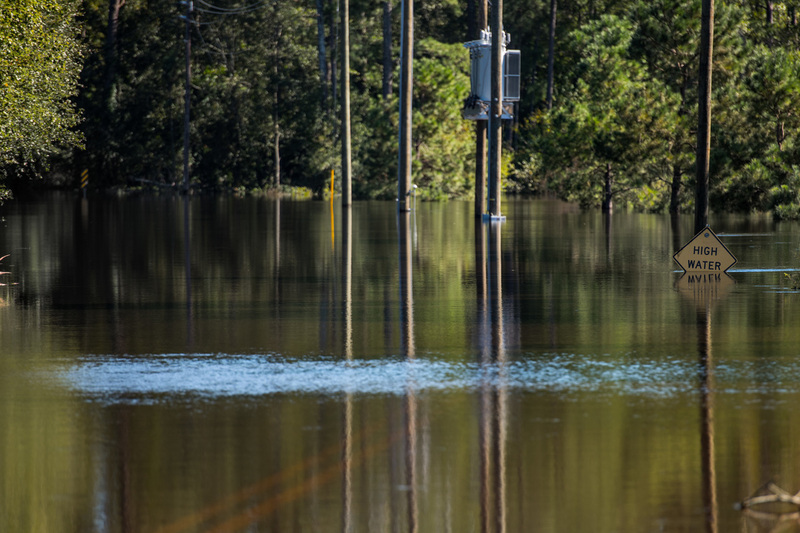 And particularly in North Carolina, the long-gone storm has continued to threaten lives as floodwaters rise, sometimes to record levels, flowing over the banks of rivers and threatening dams. The hurricane killed hundreds of people in Haiti and elsewhere in the Caribbean, and more than two-dozen people in the U.S. have died as a result of the storm, The Associated Press reports. More than half of those deaths occurred in North Carolina, where rescue operations are still underway. Early forecasts had predicted that Hurricane Matthew would turn out to sea before causing much damage in North Carolina. But the storm stayed along the U.S. coast for longer than expected, making landfall in South Carolina and bringing torrential rains to both the Carolinas. A "serious inland flooding event" began immediately, according to the National Hurricane Center, and the consequences are still unfolding as the rainwater flows downriver. 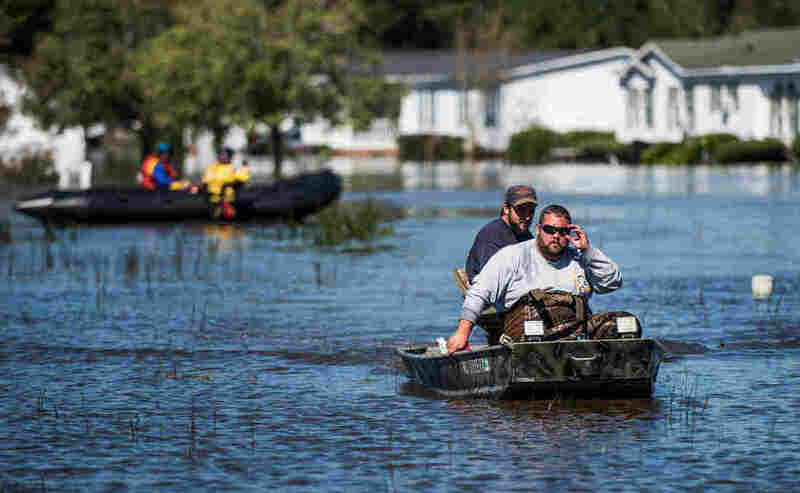 On Monday, volunteers, U.S. marshals and water-rescue crews used helicopters, boats and massive trucks to save people stranded in Lumberton, N.C., after the Lumber River burst its banks, the AP says. Residents and rescue teams navigate floodwaters in Lumberton on Monday. The U.S. death toll from Hurricane Matthew has climbed to more than 20 people. "The rescue teams were expected to be back at work across eastern North Carolina on Tuesday as the deluge rolled downstream toward the Atlantic Ocean," the wire service writes. "At least three rivers were forecast to reach record levels, some not cresting until Friday." On Monday night, President Obama signed a disaster declaration to make federal funds available to help North Carolina cope with the flooding, the AP says. Jay Price of member station WUNC got a close look at the floods in Lumberton on Monday. He told NPR that he has seen places where the floodwaters were topping the roofs of cars. "You're dealing with just massive amounts of water," he said. In what he called an "ironic juxtaposition," the sun came out and it was bright and clear in the storm-stricken towns. "The weather's great — picture perfect, in fact," he said. "It's kind of startling." The crisis is far from over. In some cases, the floodwaters aren't expected to crest until Friday. "Nobody quite knows how bad it's going to be in some of these communities, but they know it's going to be at or close to record levels," Price says. A building is inundated with floodwaters in Lumberton on Monday. 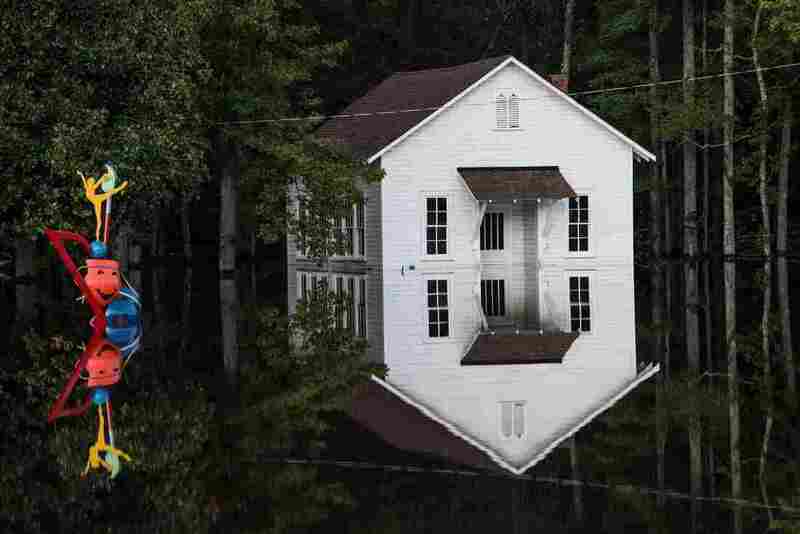 Record floodwaters were rising in some areas of North Carolina. He notes that Matthew brought "huge amounts" of rain, topping 15 inches in some areas. And that rain fell on already saturated ground. "The water just has nowhere to go," he said. "When I drove in, I was for miles and miles nowhere near any river. Do Weather Warnings Raise Enough Awareness About Flood Risks? "There were yards [flooded], there were fields flooded. And it was just because the soil was saturated and couldn't really accept any more water. "It's just rising everywhere," Price said. Meanwhile, hundreds of thousands of customers across the South still didn't have electricity. The lights went out for millions of people and businesses after Matthew arrived on the coast. In some cases, it will take weeks to get the power back on, utilities say.